What Christmas book list would be complete without a little Disney? Certainly not one for my daughter! 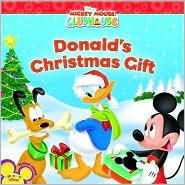 This is a cute story where even Donald, who begins the story as a Scrooge, finds the true meaning of Christmas.